All too many people start a writing project with grand ambitions but reach a crisis of completion. 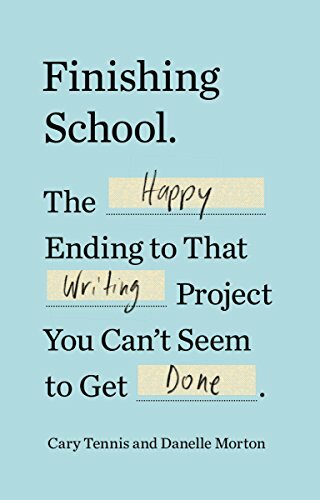 Finishing School helps writers reignite the passion that started them on the project in the first place and work steadily to get it done. Untold millions of writing projects—begun with hope and a little bit of hubris—lie abandoned in desk drawers, in dated files on computer desktops, and in the far reaches of the mind. Too often, writers get tangled in self-abuse—their self-doubt, shame, yearning for perfection, and even arrogance get in the way. In Finishing School, Cary Tennis and Danelle Morton help writers overcome these emotional blocks and break down daunting projects into manageable pieces. Tennis first convened a Finishing School so that writers could help one another stay on track and complete their work. Since they weren’t actually critiquing one another’s writing, there was no jockeying for the title of best writer or the usual writing group politics; there was only a shared commitment to progress. Without guilt, blame, and outside critique, students were more productive than they imagined possible. Through this program, they were able to complete novels that they’d been struggling with for almost two decades, finish screenplays drafts, and revive interest in long-neglected PhD theses. In this book, the authors share this proven and easily replicable technique, as well as their own writing success stories.